How Much Do You Really Know About Domestic Violence? Domestic violence is one of the tragic situations that you might have faced in service of families. But what, exactly, constitutes domestic violence? …a pattern of abusive behavior in any relationship that is used by one partner to gain or maintain power and control over another intimate partner. Domestic violence can be physical, sexual, emotional, economic, or psychological actions or threats of actions that influence another person. This includes any behaviors that intimidate, manipulate, humiliate, isolate, frighten, terrorize, coerce, threaten, blame, hurt, injure, or wound someone. USDOJ goes on to further define the various kinds of abuse. When it comes to the civil and criminal actions, however, did you know that nearly every state and U.S territory has its own statute that defines domestic violence? Further, did you know that definitions for civil and criminal actions differ? Each state and territory uses the civil definition to help victims obtain protection orders and access protective services. It uses the criminal definition for actions that can lead to arrest and prosecution of alleged perpetrators. 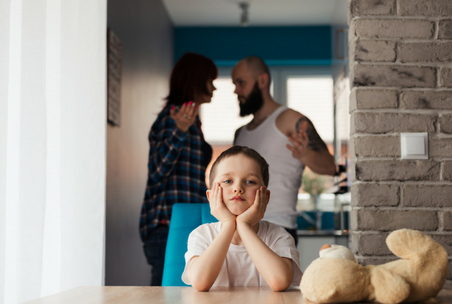 Knowing what describes domestic violence generally and how your state or territory defines domestic violence in civil and criminal actions specifically will help you to more effectively serve dads who can be perpetrators or victims. While more women than men are victims of domestic violence, the difference is not as large as you might think. What makes domestic violence so tragic is its effects not only on the victims but on the children exposed to and who witness it. The NCADV states that 1 in 15 are exposed to it, and 90 percent of those witness it. Witnessing domestic violence is considered an “adverse childhood experience” with all of its negative outcomes. To bone up and increase your knowledge of domestic violence, thoroughly review the resources provided by the USDOJ and the NCADV. In addition, use the following resources and organizations. The Child Welfare Information Gateway, the federal government’s clearinghouse on child welfare, provides this excellent, detailed guide to the civil and criminal definitions in each state and territory that have them. National Fatherhood Initiative (NFI) also provides the Understanding Domestic Violence™ Booster Session, a three-part workshop you can use as a stand-alone service to dads or as an add-on to any fatherhood program. It raises dads’ awareness of what is domestic violence and how to spot the signs of it in themselves and others. Many organizations use it to help meet the requirements of a domestic violence component in their work with dads. If you are ever concerned that someone you serve is a victim of domestic violence, refer them to the National Domestic Violence Hotline (1-800-799-7233) for immediate crisis assistance. How often have you suspected someone you serve is a victim or perpetrator of domestic violence? Does your organization have a domestic violence protocol that guides staff in how to handle suspected cases?